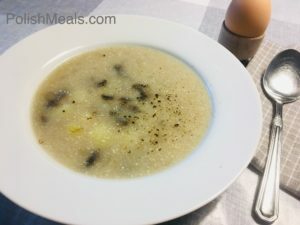 Polish Sour Rye Soup that in Poland is called ‘Zurek’ is a traditional sour soup in the county. The sour is made of rye flour with spices and the soup itself has different variations depending on the area of Poland. It can be eaten alone as well as with meat and mushroom. I don’t recall my Mom or Grandmother making the starter (sour mixture called ‘zakwas’) because you can easily get it in every store in Poland. However, if you don’t near the Polish neighborhood, you might have a trouble finding it on the grocery shelf and make it yourself. Recipe here soon. 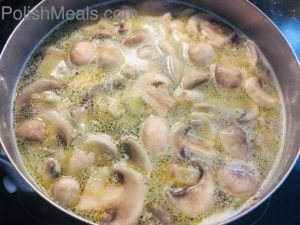 In this recipe I will show you the meatless ‘lent’ version of the soup that is limited to potatoes, mushrooms. This one is a traditional Easter dish. 3. Add 1,5l water, 2 tsp salt, bay leaves, allspice and bring to boil. 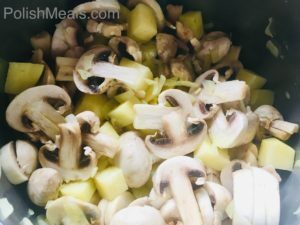 Cook 15 min or until potatoes are soft (it depends on potato type). 4. Add starter and bring to boil. 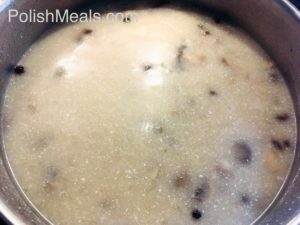 The soup will thicken as there is flour in the starter. Cook 3 minutes stirring. 5. 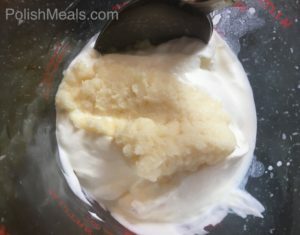 (Optional) Mix together 1/2 cup of sour cream with 1 tbsp grated horseradish. Add some soup to mixture and still until smoith, then slowly add to all soup stirring all the time so it mixes well. Bring slowly to boil and turn off. This soup can be served with hard-boiled egg, white beans, bread. Posted in: Easter, Holidays, Soups. Tags: easter, flour, potato, rye, soup, sour.